This certainly isn't the largest one I have ever seen. That one was on Cape Cod, MA, and had a wingspan of about six inches, the length of your hand and fingers. But it was a beautiful one. You see I was out in the yard committing the unforgivable crime of gardening. Actually I had just taken an electric hedge clipper and hacked the daylights out of my Ruellia. 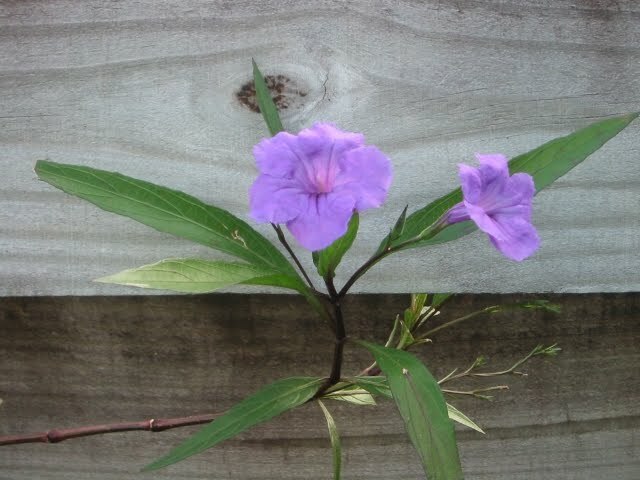 Ruellia is Mexican Petunias and it has the habit of being rather fast growing. Beautiful purple flowers that don't show up well on a digital photograph, they tend to grow on semi woody stems. They also tend to grow through my fence, my hedges, and my borders. They are very easy to propagate also, just stick them in wet soil and keep it wet for about a month. I was starting pot after pot of the stuff to fill in some gaps in the ground cover in the yard on the East side, and they are just too easy to grow. As a result, they spread over top of the roof tiles I use to define the garden. I completely lost my roof tiles and went looking for them that day and decided I had had enough. Starting at one end of the yard, I cut a pile of the stuff that ended up being a full trash can. 4 feet tall, 2 feet square. 16 cubic feet of nothing but Ruellia by my count. I could easily have used that to re-flower the neighborhood, but instead I hefted that mass into the city supplied trash cans and sent it on its way to generate electricity. Trash to Electricity in the incinerator here. Having gathered up all that "salad" I was trying to straighten my back out and catch my breath when I saw this little shiny object. It really did not care that I was there. It may have been staying there watching me and waiting for me to do something stupid. Instead, I took a picture. I liked the picture so much that I have saved it off. 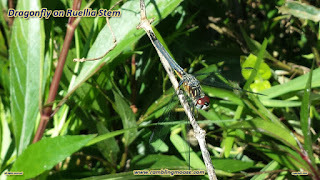 A complex looking little creature, I can understand why so many pieces of Jewelry are made to look like them. Plus they eat mosquitoes so they're welcome here any time, usually two days after a solid rain. How to Ruin a Decent Cookie - Just Wait!